Karen's Hospitality table runner, 20" x 52.5"
Come see the latest in our unique patterns for Applique and Reverse Applique for hand and machine, and the tools you need to create with ease. Show Special: Buy three or more patterns and get 20% off patterns! Lily ( 1 of 9), Rose (2 of 9). 16" x 16" blocks made with option 3: reverse applique stems and leaves with applique blossoms. Get started on your 9 block Victorian Flower Garden Quilt with the Lily, Rose, and NEW...Sunflower and Apple Blossom. Each block measures 16" x 16". 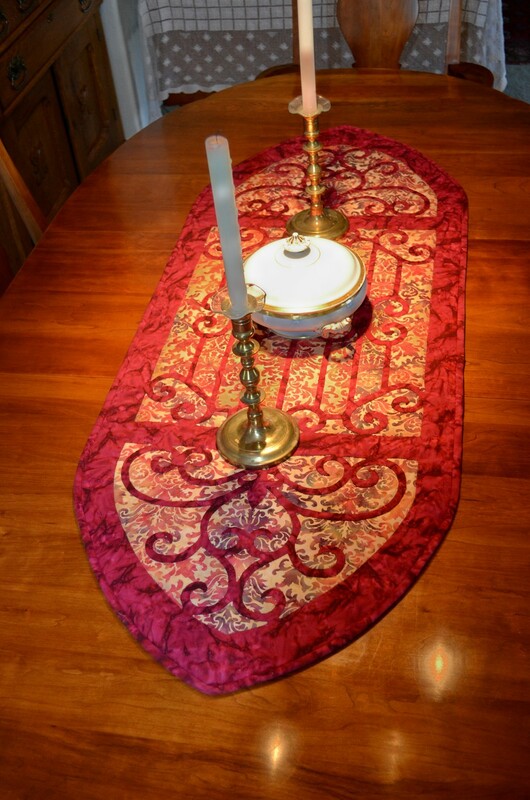 Or make Karen's Hospitality table runner, 20" x 52.5", and add a touch of elegance to your dining pleasure. For the little girl in your life we'll be unveiling Frozen Wonder, inspired by the Disney movie "Frozen", at Houston Festival. Frozen Wonder, Medallion VIII. The perfect center for a quilt. All our unique designs are available awaiting your creation, as well as the select John James needles you need, Beam N' Read Personal Light and the Desk Needle Threader or all those small-eyed needles. And pick up the New, handy technique booklet, Reverse Applique Revealed for Hand and Machine. As always, we demo our technique of Trace! Baste! Snip! & Stitch! in our booth, # 2058.